Most open water swimmers have a bucket list of swims they want to do. Their swims can be a channel crossing or an unprecedented lake swim or an ice mile. Whether it was a competitive swimmer of the 1970s or nowadays with a contemporary masters swimmer, Conrad Wennerberg's authoritative book, Winds, Waves and Sunburn - A Brief History of Marathon Swimming, remains an outstanding comprehensive work of historical information and individual inspiration. Wennerberg was the Chairman Emeritus of the International Marathon Swimming Hall of Fame until his passing on September 8th this year. He extensively documented professional marathon swimming for future generations, specifically between the heyday between the 1950s and 1970s. Wennerberg also played a key role in creating the International Marathon Swimming Hall of Fame due to his research and first-hand coverage of the most well-known competitions of that era. With his invaluable contributions, both tangible and intangible, Wennerberg played both a leading and supportive role in helping promote, document, establish and professionalize marathon swimming and its . His experience, insights and knowledge of the sport was also developed first-hand as he swam over 12,874 km (8,000 miles) while escorting and training with his athletes, including the well-known, fellow International Marathon Swimming Hall of Famers Ted Erikson and Dennis Matuch. 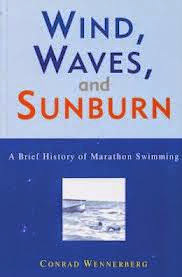 Winds, Waves and Sunburn, first published in 1974, includes the colorful history of swims in the English Channel and the Strait of Juan de Fuca, with explanations of the mindset and physical obstacles overcome by some of the most accomplished marathon swimmers in history. For someone getting into the sport or an athlete who is looking for inspiration whether pro or amateur, young or old, competitive or recreational, Wennerberg's tome is a highly recommended must-read. The 348-page book is engaging, entertaining, factual and eye-opening with numerous black-and-white photographs. Wennerberg delves into the lives, the training and motivations of the greatest marathon swimmers up until the 1970s. The exploits of larger-than-life heroes such as Abdul Latif Abou-Heif, Judith van Berkel de Nijs, George Park, Greta Anderson, Cliff Lumsdon and Marilyn Bell are detailed with insights that only an insider could know. Races such as the 1964 Lake Ontario Swim, the English Channel swims of the 1950s, and the legendary 60-mile Lake Michigan professional race are brought to life with observations on the physiology and psychology possessed by the best marathon swimmers of previous eras. As athletes ponder what is possible in 2016 and beyond, Wennerberg's legacy is clearly evident in Wind, Waves, and Sunburn, an indispensible addition to the library of any endurance athlete or coach. Wennerberg, a renowned fixture in Hyde Park community on the South Side of Chicago, Illinois, died at his home. Since the early 1960s, friend Sherry Gutman recalled that “Connie was the ‘old man’ of the Promontory Point in the great Hemingway tradition. Connie led the way for those of us who for whom the Point is sacred place to respond to the coming of winter by putting on snow clothes and sitting in the feeble winter sunlight of the Point, to dream together of the next time we could get in that water and swim away." His obituary noted that "...his decades’ long relationship with Lake Michigan and the Point gave each of us a sense that we had a richer, deeper relationship with this special spot than we had. It was his gift to us — to welcome us and make us feel at home and come to cherish the unique experience of slipping into the Lake and swimming freely in open water for as long as we wanted, or could stand the temperature." Once accepted into medical school at the University of Chicago with an interest and focus on what would later become known as sports medicine, Wennerberg transformed that interest and focus to marathon swimming. He regularly swam four to five miles on his daily swims while coaching Matuch and working with Erikson. His interest was further peaked with cold water swimming and at Quebec's Le Marathon de 24 Heures de La Tuque, where he coached the marathon swimmers who raced for 24 hours in classic summertime competitions. On a personal level, cold water swimming became ingrained in his psyche as he had swum in Lake Michigan every single day of the year for seven consecutive years. He was known to be so committed to his daily winter swimming regimen that he would take an ice pick or axe to chip away ice from the lakefront in order to create access to the cold water.